Discussion in 'News and Announcements' started by Roshen, Jan 15, 2016. Today we’re opening up the Account-to-account transfer service to our Time-Locked Expansion servers, Stormhold and Deathtoll! Account-to-Account transfers are a way that players can manage their characters. This service allows people to move characters from a single to multiple accounts so those characters can play together at the same time, or move characters spread across multiple accounts into one account to help save on membership dollars each month. BEFORE you transfer a character from one account to another, remember that you need to contact our Customer Support team! For more information about this, see the knowledge base article here. 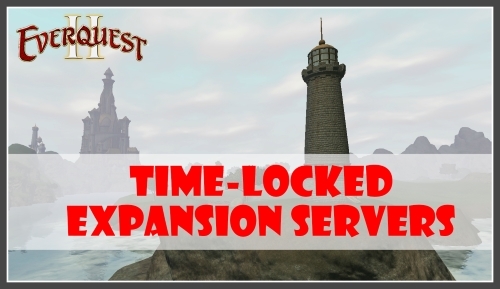 We’re happy to be opening this up to the players on our newest servers, and we appreciate your continued support! Belenos, Uwkete-of-Crushbone and Gulaep like this. Forgive me for not fully understanding this, but does it mean I can move my Stormhold toon to Maj'Dul? Darn it. I'm hoping to move my poor toon over to Maj'Dul one day. I hardly ever play Stormhold, because I found I only enjoyed the starting areas. I don't want to remake her, because I tend to get attached to my toons. But thanks for the prompt response! “Today we’re opening up the Account-to-account transfer service. Roshen, it'd be wonderful if you all did this for normal servers too one day, not now, but one day (soon). I have three EverQuest II accounts that I would love to combine into one. I did not plan on having three at all, it just happened somehow. One is All Access the other two are free-to-play. I can only pay for one subscription, and have always paid for just one subscription so in my case it is not like Daybreak would be losing out on monthly fees from me. I hope you all will consider it. EDIT: I think I misinterpreted what Roshen meant. I thought Daybreak was offering a "free" service for a short period of time, like the free server transfers we just had. Apparently this may just be the Marketplace item that players normally purchase, and now I guess those on Stormhold and Deathtoll can now buy it. They don't do it anymore? I know they used to because I did it once, ages ago. Just recreate a toon on Maj'Dul u will be the same level in like 2hours. Hmm, I guess I misinterpreted what Roshen meant. I thought Daybreak was offering "free" account to account transfers for a certain time period, like the free server transfers we just had not too long ago. Yeah, come to think of it now Alphonsus, Roshen just probably meant Stormhold and Deathtoll can now "pay for/buy this service" from the Marketplace. Bummer. I cannot afford the $25/per character or whatever the fee is. Where do you purchase? I looked under services but do not see anything. Belenos and Uwkete-of-Crushbone like this. on TLE you may not see the tokens, just contact customer service and use that link Roshen posted in his thread to make sure you meet the requirements. If you do see the token, do NOT purchase until customer service says to as they are not refundable. Gramma and Uwkete-of-Crushbone like this. Boxing has always been allowed. Botter = gamer(s) who employ third-party programs to control their characters. Boxer = gamer(s) playing as multiple separate characters simultaneously either by using multiple separate machines to run the game or by running multiple separate instances of the game. SynnikuL, Feldon, Belenos and 6 others like this. “Boxing has always been allowed. Belenos and Griffon Lady like this. Belenos, Kuulei, Uwkete-of-Crushbone and 1 other person like this. it costs about 2500 db cash . anyway I think on this thread its just about that you can also do it on the TLS servers. The PVP server I'm assuming would stay as it was, since there is no other PVP server, but it could have the same fate as the PVP. /shrug But who really knows till the time comes? Prissetta, Belenos and Uwkete-of-Crushbone like this. Ah, I see. Let's make the mobs hard enough so that a number of classes can't handle solo mobs unless they have a partner or a box and group mobs so that small guilds may have to supplement with a box... and then huzzah! we will help you out by selling you a way to split your high toons so you can box more efficiently! The company changes... the tactics stay the same. Ceyllynn and Eradani like this.